Guest passes are another cost effective, impression builders way to generate new leads. Guest Passes are highly effective when use in conjunction with contest boxes. Have your sales team hit the streets and hand these out to prospects or simply place them with your contest entry box and start watching your sales grow. 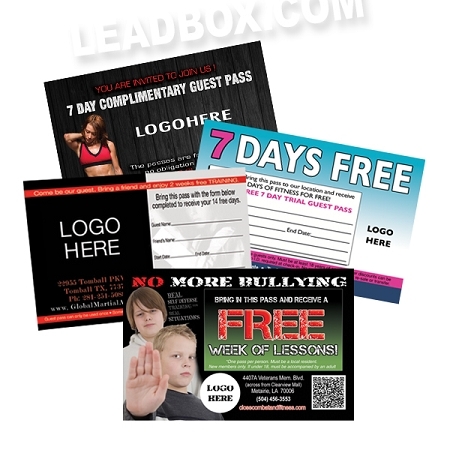 These are also great for distributing in the club for member referral campaigns. 2500 Full Color Guest Passes. Shipping and Design Set Up Fee also included. 4.25" x 2.75"(slightly larger than a standard business card), 4 Color, Both Sides, 14pt gloss cover. 2. Tell us what your offer will be. For ex: Bring in pass to receive your free VIP pass..
3. We will confirm via email or phone. 4. You will receive a proof within 24-48 hours of your design.